Fabrication of optofluidic systems requires synergetic incorporation of micro-optical components in microfluidic networks. 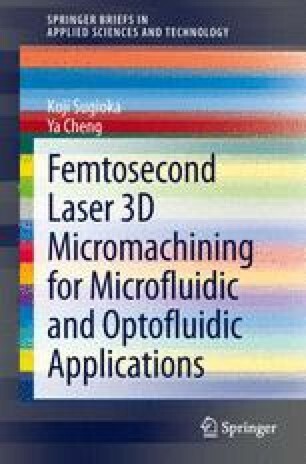 This chapter describes key techniques for fabricating optical waveguides and free-space micro-optical components in glass by femtosecond laser microprocessing, both of which are essential building blocks for optofluidic devices. It is straightforward to fabricate optical waveguides as femtosecond laser irradiation can change the refractive index of glass through multiphoton absorption in the focal volume. Free-space micro-optical components such as micromirrors and microlenses can be fabricated using femtosecond-laser-assisted wet chemical etching to form hollow structures with planar or curved surfaces in glass that serve as optical interfaces. Micro-attenuators can be embedded in glass with a high spatial resolution and controllable attenuations by synthesizing silver nanoparticles in photosensitive glass using femtosecond laser irradiation and subsequent heat treatment.